When you build a swim spa or hot tub near Birmingham, AL , you’ll have a relaxing place to hang out with your family, exercise, and recoup from the day’s stresses. 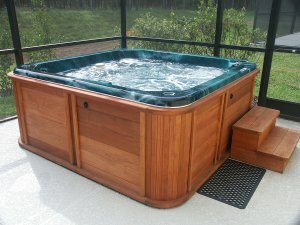 Sitting in or exercising in a hot tub can offer a number of physical and psychological health benefits, making a hot tub a very wise investment for you and your family. Exposure to the warm water in a hot tub or swim spa can increase blood flow, reduce blood pressure, relax muscles, and provide temporary pain relief. When you’re relaxing in a hot tub, your body becomes more buoyant. This relieves pressure on your muscles, joints, and bones. Exercising or even just sitting in a hot tub can relieve symptoms of arthritis and muscle aches and pains. Exercising in a hot tub significantly improves muscle strength and tone, helps you lose weight, and improves diabetes symptoms, as the water allows for low impact exercise and resistance exercise. Spending time in a hot tub will increase your heart rate in addition to decreasing your blood pressure, which can improve your cardiovascular health. These benefits also extend to your sleep cycle, reducing symptoms of sleep disorders. An Above Ground Pool in your backyard is a great place for family and friends to spend their hot summer days. Swimming is not only fun, but is a great way for kids and adults to exercise! However, having a pool requires safety measures. First and foremost, there is no substitution for vigilant supervision. Always have an experienced swimmer, preferably an adult, nearby when swimming. Make sure that all individuals are able to swim. If children or adults are unable to swim, make sure they are wearing approved safety swimming devices. It is a good idea that someone around the pool area be CPR certified. On hot summer days, make sure that everyone wears appropriate-strength sunscreen. There are very few things as painful as a blistering sunburn. Above Ground Pools usually have a 4 foot water depth. This depth is not adequate for diving into the pool or adding a slide to the pool. Serious injury is subject to occur when children and/or adults are diving or sliding in this water depth. If an Above Ground Pool has a deck built around it, make sure that there are safety rails around the deck and a self-locking gate at the entry point. If a ladder is used as the pool entry system, make sure that the outside of the pool ladder can be secured. This will allow the entrance to become inaccessible to small children. Alarm systems are also great safety features for Above Ground Pools. When the pool water ripples or changes levels due to pool entry, the alarm will sound inside and/or outside the home. This is a great feature for homes with small children, pets, and possible pool-intruders. The top rails, or top ledges, of the Above Ground Pools are not designed for walking or sitting. Falling from these top rails to the ground could cause serious injury. Safety signs are important for all pool areas. These safety signs may include pool rules, pool depths, and pool safety precautions such as “No Diving”, “Shallow Water”, and “Deck Slippery When Wet”. Have you been thinking about having a swimming pool installed in your yard? Summer is almost here, which means now is the perfect time to call the professionals. Don’t go another summer wishing you had a pool where you can relax and entertain your friends—make it reality. Swimming pools offer you many benefits, including exercise, relaxation, and just plain fun. 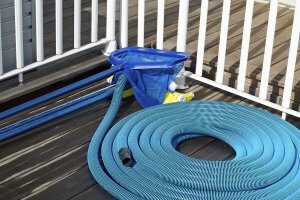 In order to keep your pool in good shape, you’ll need the right pool supplies in Birmingham . Read on for a look at the most essential pool supplies to have on hand this year. Keeping your pool water clean takes more than just a pump and filter. Chemicals are needed to make sure the water is free from bacteria that can make it cloudy, and damage your skin or the pool itself. Chlorine is the main chemical associated with swimming pools, but you’ll also need alkaline balancing agents as well as calcium to keep the water clean and clear. Invest in a water testing system so you can see what the pH level is in your pool. That way, you’ll know what chemicals you need to add more of to maintain the proper balance. Swimming pools have pumps that circulate water, and the filter works to clear out the contaminants from the pool. You can choose from sand, cartridge, or diatomaceous earth filters, depending on how much maintenance you’re willing to do. Sand filters are able to filter out smaller particles, while diatomaceous earth filters can handle much larger particles. There is a good reason for working hard to keep your pool clean and safe: So you can have fun with your friends and family! Grab a few pool toys such as noodles, rafts, and games so that everyone is comfortable and entertained. Pool games are a great way to have fun and be active at the same time, especially when you have children. Proper pool maintenance for your above ground pool in Birmingham, AL, will help keep your backyard oasis clean, beautiful, and safe. 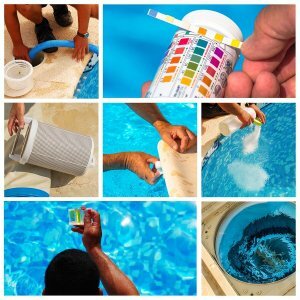 Essentials of swimming pool maintenance include circulation, filtration, cleaning, and testing. AllStar Pool & Spa is the premier company for providing expert installation of above ground pools and hot tubs to the Birmingham area. Contact us today or visit our website to learn more about our exceptional services and high-quality products.